I apologize for the lack of posts these past few weeks but the birth of Sweet Baby J has made a bit of a change to my schedule. Luckily there are some wonderful bloggers who have provided posts for you. The first of these is Kristie from Kristie’s Blue Jeans. Thank you Kristie! Hey y’all! I am Kristie over at Kristie’s Blue Jeans and I am so excited to be taking over while Yvonne is spending time with her sweet little bundle of joy! 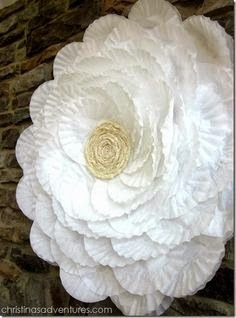 All that is needed to make this gorgeous flower for your wall is two packages of coffee filters, a hula hoop, hot glue, and a piece of burlap ribbon. This seems simple enough for me to make and dare I say, hang in one Saturday. This gorgeous wreath is just coffee filters, foam tubing, hot glue and ribbon. I saw this and just about died of envy then I realized it was coffee filters and I knew this had to be added to my craft list. Now I know Christmas is over, but I am a sucker for Christmas crafts and I just love this tree and wreath. It’s a perfect gift for anyone! Coffee filters, foam, ornaments (optional) and hot glue. I even found this awesome pin on how to dye coffee filters so that not everything is always white, because fabulous crafters need some color in their lives!!! Remember to stop and see me at Kristie’s Blue Jeans.